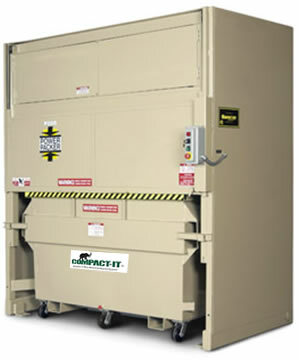 Vertical Compactors are perfect for limited space and eliminate the mess of front load containers. They are designed to compact a combination of wet and dry waste. They are made with “front load” containers and can be positioned so that they serve as a nearby disposal area. There are a few models of these compactors that can be equipped with casters (on the “front load” containers) and allows customers to roll the full containers to a location that is convenient for the hauler to pick-up. 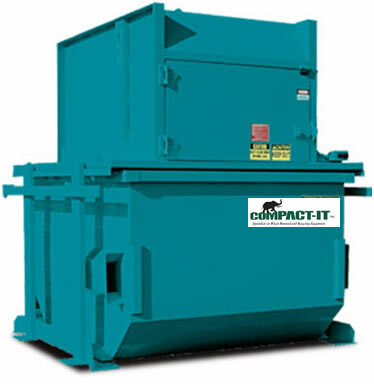 Vertical Compactors are available with standard options such as 3 phase or single phase power and odor control. Some of the units are designed to “plug into” 120V/ 20 AMP wall outlets. Vertical compactors are available with container sizes of 2, 3, 4, 6 or 8 cubic yards to fit your specific needs (however due to hauler restrictions, the 2 and 3 yard are typically the only models available with casters).